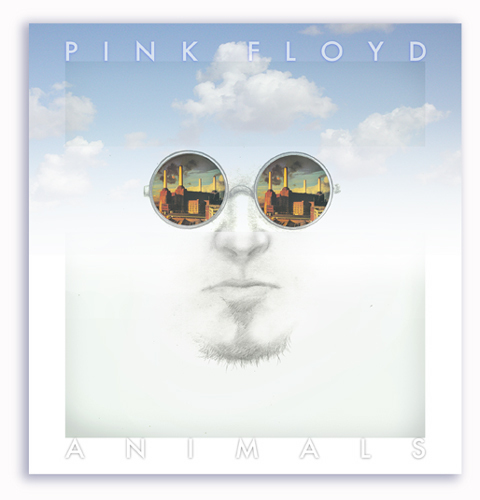 Released in 1977, "Animals" is a searing aural trip. One of my favorite PF albums. Pink Floyd? Man, are you dating yourself now! Go to You Tube and look up the episode where Dr. Fever is playing this album. His answer to Carlson (the boss) is great! Go to You Tube and look up the episode of WKRP in Cincinnati where Dr. Fever is playing this album. His answer to Carlson (the boss) is great! Cool! But how dare you take on redesigning a Hipgnosis creation. Yeah....I know you're a big Hipgnosis fan so I'm not too terribly surprised by your accusatory blandishment. But hey, if you can't tweak EVERYBODY, then you can't tweak ANYBODY. I really dig David Gilmour, but Floyd music never really did it for me. I spent a while woodshedding the guitar tracks, but I hardly remember any of the lyrics. Where I went to school, Floyd was mainly one of the bands the dark, pretentious "wannabe intellectuals" listened to--although there was one guy who was a super-genius who liked them as well. I didn't find PF until long after they were big. They and Alan Parsons are the two main groups from that era that I really enjoy--still. I enjoy your piece of work, thanks for all the informative content . some truly nice and useful information on this internet site , besides I think the layout holds good features. I like this web blog its a master peace ! I am delighted that I found this website , precisely the right information that I was searching for! I believe this internet site holds very great indited subject matter content . Ken is also keen to see the lighter side. "We don't tout HurryDate as a way of meeting your soul mate. We focus more on a great event where you have lots of fun." You made several fine points there. I did a search on the subject matter and found nearly all persons will go along with with your blog. This article is good but I disagree with some certain points in it. Oh well, I am not a complete expert on the matter. Thanks for the article anyways. What a great opportunity to finally read something worth reading. thanks a lot and keep posting articles like this for us to read. Hey very cool blog!! Man .. Excellent .. Amazing .. I'll bookmark your website and take the feeds also…I'm happy to find a lot of useful information here in the post, we need work out more strategies in this regard, thanks for sharing. . . . . .
Orange is also said to the need for food, which is why many restaurants have orange in the dining room should be increased. Great weblog and I really like what it's important to say and I believe I will tweet this out to my buddies to allow them to test it out as well. I like what it's important to say. great post and I utterly agree with you on all factors and I am fascinated about including a hyperlink on my weblog to your weblog submit as a result of its that good. interesting post.the information are detailed and clear. This blog always puts such good contents. Thank you for the information. You may also like to visit mine for machines. You're welcome. great post, very informative. I wonder why the other specialists of this sector do not notice this. You should continue your writing. I am sure, you have a great readers' base already! We are a group of volunteers and opening a new scheme in our community. Your site provided us with valuable info to work on. You've done a formidable job and our entire community will be grateful to you. I have observed that over the course of making a relationship with real estate managers, you'll be able to come to understand that, in every single real estate purchase, a commission rate is paid. Eventually, FSBO sellers do not "save" the commission rate. Rather, they fight to earn the commission by means of doing an agent's work. In this, they expend their money plus time to accomplish, as best they could, the responsibilities of an real estate agent. Those obligations include revealing the home through marketing, delivering the home to prospective buyers, constructing a sense of buyer urgency in order to trigger an offer, scheduling home inspections, controlling qualification investigations with the loan provider, supervising maintenance tasks, and aiding the closing. This page contains a single entry from the blog posted on November 9, 2010 11:09 AM.